China's property market is expected to continue stabilizing in the fourth quarter of this year, a senior official said Sunday. 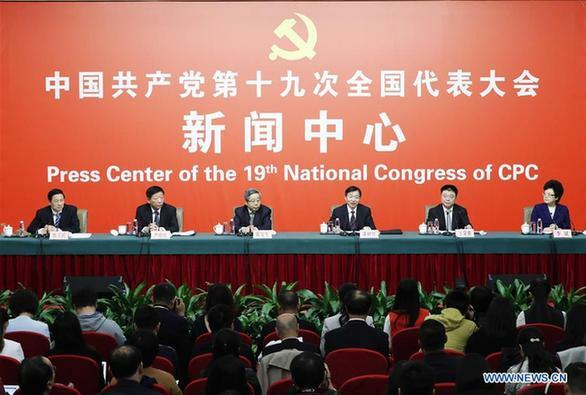 The market will continue to see slower growth in transaction volume and stabilizing prices, Minister of Housing and Urban-Rural Development Wang Menghui told a press conference on the sidelines of the 19th National Congress of the Communist Party of China. "For the whole year, the property market will maintain a stable performance," he said. The government will not waver in its efforts to achieve the goals of property market regulation and will maintain continuity and stability of policies, Wang told reporters. Authorities are studying a "long-term mechanism" for real estate regulation and advancing legislative work on the development of the home rental market, he said. Regulatory moves since October last year have produced effects, curbing property buying for speculative and investment purposes and reining in excessively fast price increases, said the minister. He pledged to move faster to put in place a housing system that ensures supply through multiple sources, provides housing support through multiple channels, and encourages both housing purchase and renting. China's rocketing housing prices, especially in major cities, had fueled concerns about asset bubbles before dozens of local governments passed or expanded their restrictions on house purchases and increased the minimum down payments. The market was also cooled down by relatively tightened liquidity conditions as the government moved to contain leverage and risk in the financial system. Last month, the country's housing authority endorsed a pilot joint ownership housing scheme in Beijing and Shanghai to provide affordable housing. The government is also carrying out pilot programs in 12 large and medium-sized cities to increase rental housing supply and set up government-backed home rental service platform to address rising demand from urban newcomers. Of the 70 cities surveyed in August, the pace of new home price growth slowed in 15 compared with the same month of last year, official data show.